It's amazing how I seem to be able to pack so little into my rest days. I look forward to them with pleasure, I wake up comfortable and happy in the knowledge that today I don't have to push it. I can relax and enjoy the normal things in life. Being warm, dry and clean. Eating real food instead of bars or packets of salami. Sleeping in. Doing laundry, catching up on emails and writing postcards. Eating oreos. This is my 4th rest day on the Alpine Coast to Coast out of 27 days and the same thing has happened again, the day has flown by. Before I know it I look at my watch and think "how is it 6pm, I've done so little." On the contrary, it's amazing how much I seem to be able to pack into my more active days on the Alpine Coast to Coast. Take yesterday for example. Charley and I climbed Mont Blanc, as you do! We woke up at 1am, had breakfast at 1:30am and left the hut by 2am. By 9am we were standing at 4810m, the highest point in Western Europe. By the time we got back to the hut just shy of 12 hours later, passing across the Grand Colouir and retracing the steps we had taken in the dead of night, it felt like days had passed since we'd been there. The amount we're able to pack into these days is phenomenal. There's nothing that differentiates you or I from anyone else who has achieved something we aspire to, apart from the fact that they went out and made it happen. I want to be a do-er not a talker. So, we climbed Mont Blanc. Wow, that was big! We totally underestimated it as you may have read about in my last blog, One Step Too Far. 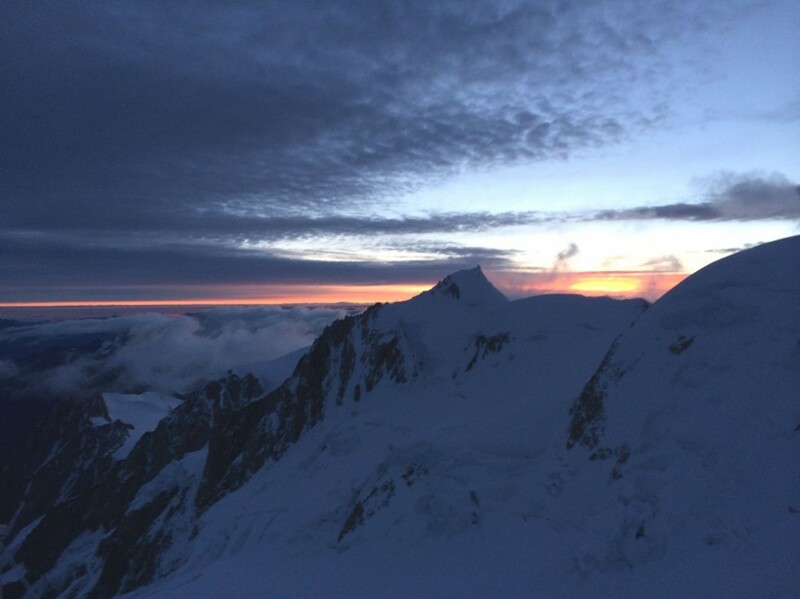 I seem to have developed a case of adventure-flu and the night before last when we were in the Tete Rousse hut preparing for our second attempt on Mont Blanc, I didn't know if I was going to be able to make it. 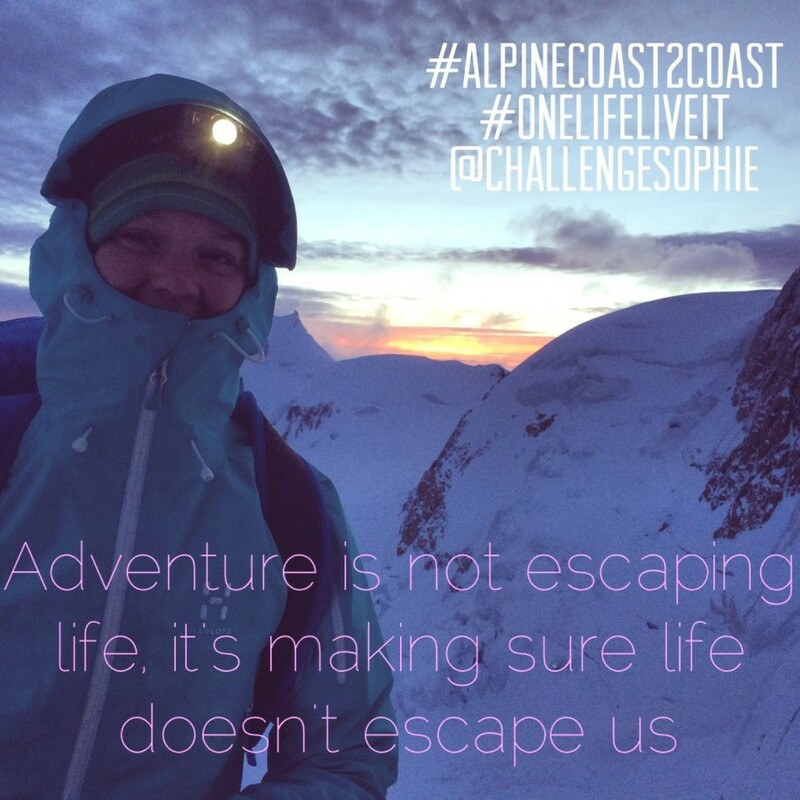 I was worried about the challenge of climbing Mont Blanc of course, but it was the days beyond that, the final hurdles on the Alpine Coast to Coast challenge that made me feel uneasy, anxious and put a heavy weight on me. After dinner, I felt totally out of the game. I went outside and watched the sunset (if you haven't seen the sun rise and/or set from above the clouds I HIGHLY recommend it). The view was stunning but I couldn't enjoy it as I normally would and inside me everything was tightening up. When you have a cold, the smallest thing can seem like the biggest deal. Imagine how I felt knowing I had to climb Mont Blanc. I spoke to my Mum and went to bed at 8pm. I tried to sleep but couldn't. I woke up every hour having lucid dreams and all these thoughts and worries in my mind. I knew I had to get through this and the only way to do it was to focus on one step at a time. I worked out rough timings of how long it might take to get up Mont Blanc and back down, roughly 12 hours. All I needed to do was to get through until the following afternoon. I put everything else out of my mind to deal with when they needed to be. I thought about how epic all of the climbs on this adventure have been, how Charley and I have experienced so much on each of them, how really they've been the biggest challenges, accomplishments and most rewarding elements. I started to relax a little and feel excited for the climb. 30+ hours later and I can look back on my previous worries and smile. Climbing Mont Blanc was tough, but we did it! It wasn't ideal for my cold and I do feel worse now, but I'll heal. Yes I feel tired, but I'm also stronger. I'm now relaxing at home in Chamonix and getting my head around what lies ahead. 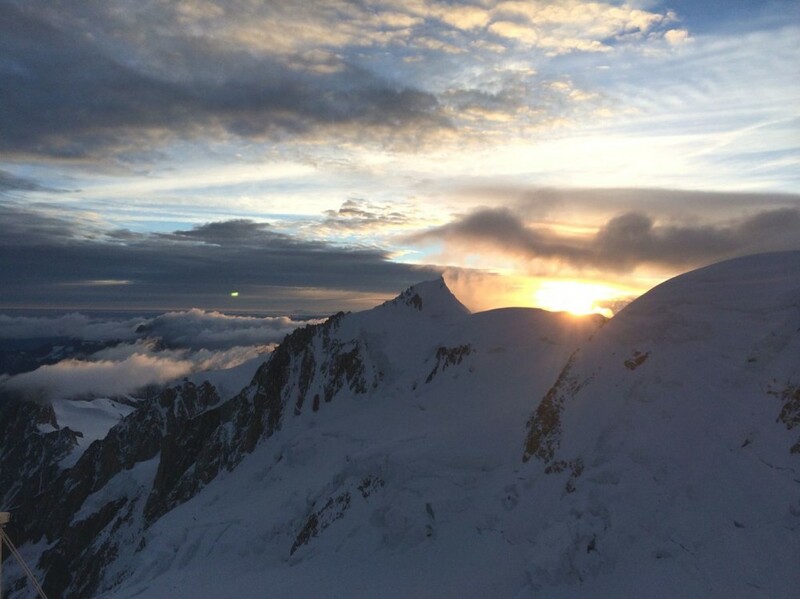 Now that we have successfully climbed Mont Blanc, it does feel as though we've overcome a massive hurdle. There were eight legs to the Alpine Coast to Coast and we have two more left. Followed by a climb to Italy's highest point - Gran Paradiso - at 4061m. Finally, a 400kms cycle down to the coast ending in Monaco. It's the final countdown and I can smell the finish line! However, I can't lose sight of the hurdles in front of me. Still a few mountains to go. I dont want to make mistakes, or forget how much it's going to hurt. In any endurance event, I always find the last few miles are the toughest because mentally I think I've done it and once my mind loses that focus I can struggle to summon what it takes to cross the line. As we enter into the last two legs, just wanted to say a MASSIVE thanks for all your support. It really does mean so much, hearing that you're all behind us. It's amazing and I will be dipping into it a lot over this next section to get me through. Thank you. I won't get the chance to blog again until this is complete, but I look forward to doing so! In the meantime, I'll be updating Facebook, Twitter and Instagram regularly.